We had a wonderful crop of Honeycrisp Apples this year. I love to eat them fresh, but sometimes when you have a lot, it is impossible to keep them all fresh if you do not have the right storage temperatures and humidity. This year we have a lot of windfalls and they definitely have a shorter storage life. Now I really don’t have a lot of freezer space and I am not always in the mood for canning – so I come up with ways we can use apples with our daily meals. One way to use a lot of apples is to make apple sauce. Now I love to eat apple sauce with cottage cheese, yogurt or just plain. It also comes in use for ingredients in other recipes. Before I get to some other recipes, I will briefly cover how to make apple sauce. 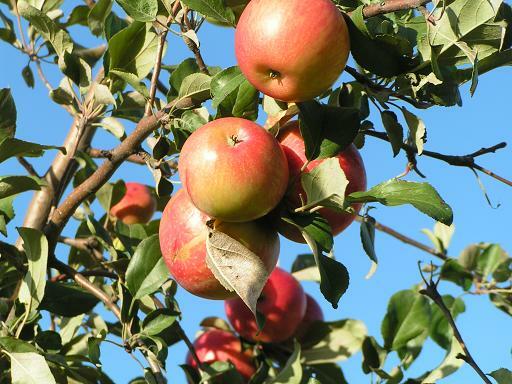 First, peel and cut out cores in apples and any “bad spots”. Put them in a sauce pan with about an inch a water. Cook until very soft. Some people like their apple sauce with a little more texture, but I like mine smooth, so I put it in my vita-mix and puree into a smooth sauce. I add a little sugar – viola! It is ready to eat! Some people like to sprinkle a little cinnamon as well. In the following recipe, I use my home made sauce. The following is a very quick dessert to make but a very elegant looking one to serve! Mix one quart of the apple sauce with one cup of the whipped cream. I use the lowest speed on a handmixer to do this. Mix until smooth. 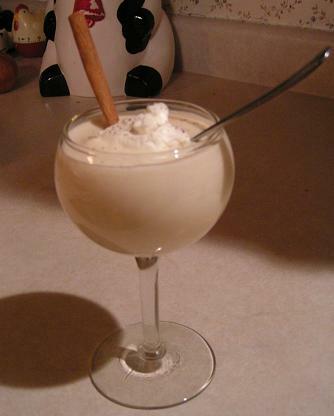 Pour into dessert glasses and garnish each with a tablespoon of whipped cream and a sprinkling of cinnamon. Place a cinnamon stick in each glass if desired. Apple Crisp - an all time favorite. This recipe actually came from a “lunch lady” at my old junior high school. It is funny because when someone says “school lunches” people don’t usually run for the recipe, but this is one of those weird things where they got it right. I know you will like it!!!! Set apples aside and mix all the other ingredients with a pastry blender or whisk. Pour half the crust mixture on bottom of a 8×8 cake pan and press down smooth. 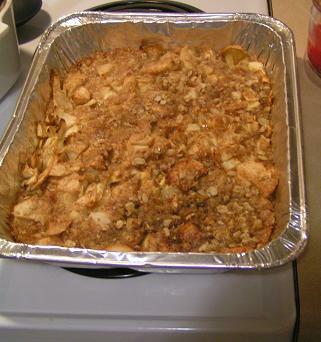 Cover with apples and then remaining crust ingredients. Press down to smooth crust. Bake for about 30 minutes at 350 degrees. This is most wonderful served warm with a scoop of whipped cream!